Home World News	A Treaty Is Reached to Ban Nuclear Arms. Now Comes the Hard Part. Some critics of the treaty, including the United States, publicly rejected the entire effort, calling it misguided and reckless, particularly when North Korea is threatening a nuclear-tipped missile strike on American soil. Disarmament groups and other proponents of the treaty said they had never expected that any nuclear-armed country would sign it — at least not at first. Rather, supporters hope, the treaty’s widespread acceptance elsewhere will eventually increase the public pressure and stigma of harboring and threatening to use such weapons of unspeakable destruction, and make holdouts reconsider their positions. “This treaty is a strong categorical prohibition of nuclear weapons and is really rooted in humanitarian law,” said Beatrice Fihn, executive director of the International Campaign to Abolish Nuclear Weapons, a Geneva-based coalition of groups that advocated the treaty. 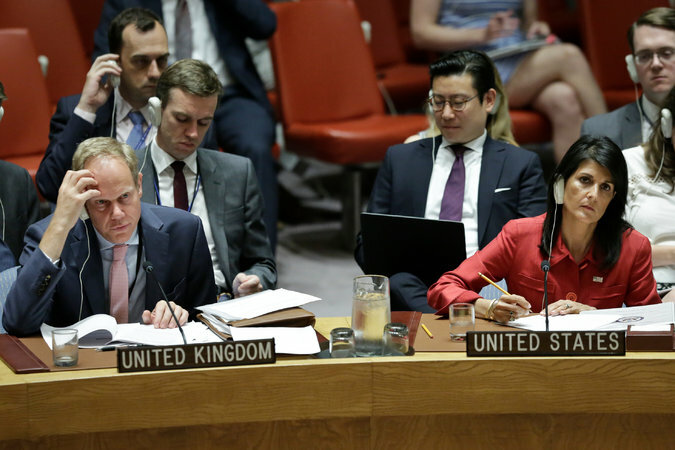 Nikki R. Haley, the American ambassador to the United Nations, and Matthew Rycroft, the British ambassador to the United Nations, at a Security Council meeting on North Korea on Wednesday, after Pyongyang tested an intercontinental ballistic missile. Treaties that banned biological and chemical arms, land mines and cluster bombs have shown how weapons once regarded as acceptable are now widely, if not universally, reviled. That is the kind of outcome sought by proponents of the nuclear ban pact. “While the treaty itself will not immediately eliminate any nuclear weapons, the treaty can, over time, further delegitimize nuclear weapons and strengthen the legal and political norm against their use,” said Daryl G. Kimball, executive director of the Arms Control Association, a Washington-based group that supports the treaty. Nuclear weapons have defied attempts to contain their spread since the United States dropped two atomic bombs on Japan in 1945, ending World War II. The destruction wrought by those weapons helped give rise to the nuclear arms race and the doctrine of deterrence, which holds that the only way to prevent an attack is to assure the destruction of the attacker. Proponents of deterrence argue that it has helped avert a calamitous global war for more than 70 years. Besides the United States and Russia, which are believed to have the largest nuclear arsenals, Britain, China, France, India, Pakistan, Israel and North Korea all have nuclear bombs. Ms. Fihn said the standoff between North Korea and the United States over the North’s nuclear weapons and ballistic missiles illustrated what she called the fallacy that the deterrence theory can keep the peace. Under the 1968 Nuclear Nonproliferation Treaty, signed by nearly all nations, parties are required to “pursue negotiations in good faith” aimed at advancing nuclear disarmament. The new agreement is partly rooted in the disappointment among non-nuclear-armed nations that the Nonproliferation Treaty’s disarmament aspirations have not worked. The new accord will outlaw nuclear weapons use, threat of use, testing, development, production, possession, transfer and stationing in a different country. For nuclear-armed nations that choose to join, the treaty outlines a process for destroying stockpiles and enforcing the countries’ promise to remain free of nuclear weapons.